Harmony H-22 Model Electric Bass Guitar (1967), made in Chicago, serial # 6723H22, sunburst lacquer finish, laminated maple body, maple neck with rosewood fingerboard, black gig bag case. One of the 1960s' finest bass bargains, the Harmony H-22 "Hi Value" Electric Bass retailed originally at $99.50 and was the company's first bass guitar offering. The H-22 was officially introduced in Harmony's 1962 catalog; it remained pretty much the same into the late '60s when the body design was altered to a double cutaway. 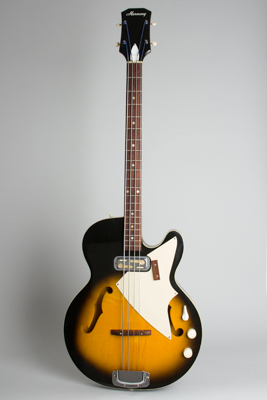 This 1967-made bass features a lightweight flat-topped fully hollow body mounting one excellent-sounding DeArmond pickup down by the neck. The neck itself is thick but comfortable, with a 30" scale dot-inlaid rosewood fingerboard. This one has the later single-piece stamped metal tailpiece unit -- otherwise, it is identical to earlier models. This would be one of the last examples of the original single cutaway design; the double cut model debuted not long after this one was built. The bass' most distinctive cosmetic feature is the large white plastic off-center pickguard, which has limited function, but certainly has an unmistakable look! The controls are simple, with single tone and volume knobs and a large white plastic "klunk" lever switch that works with the tone control for instant tone modification from dark to "baritone." The H-22 was very popular with teenage garage bands and also used extensively in the mid-1960s by both Muff Winwood in the Spencer Davis Group and Ronnie Lane of the Small Faces, and its aggressively thumpy tone can be clearly heard on many recordings. Popular up into the late 1960s, the H-22 has recently again become a much used and sought-after item with new generations of players discovering its quirky charm, extremely easy handling, and excellent sonic qualities. Overall length is 44 1/2 in. (113 cm. ), 15 5/8 in. (39.7 cm.) wide at lower bout, and 2 in. (5.1 cm.) in depth, measured at side of rim. Scale length is 30 in. (762 mm.). Width of nut is 1 3/4 in. (44 mm.). A superbly clean and original bass, with just some light wear overall. The bone nut is new (the original was missing a big chunk) and the pickguard looks correct, but the color is a bit less white than we're used to, so we're not sure either way on that. Everything else appears original. The hard plastic truss rod cover has a small repair at the top screw hole; there are no other repairs. Plays great, sounds great -- absolutely one of the nicest of these very sought-after basses we have had. Excellent Condition.